I can let go of desserts, even shoes, but never, ever take music and my books away from me. I have always fancied creating a sort of last will and testament, only it won’t bequeath money and property to my loved ones. It will bequeath books and my journals to them, plus my mixed cassette tapes, my hard disk drives, my stuffed toys, and of course, my tiny pillow. just look at this small pile! 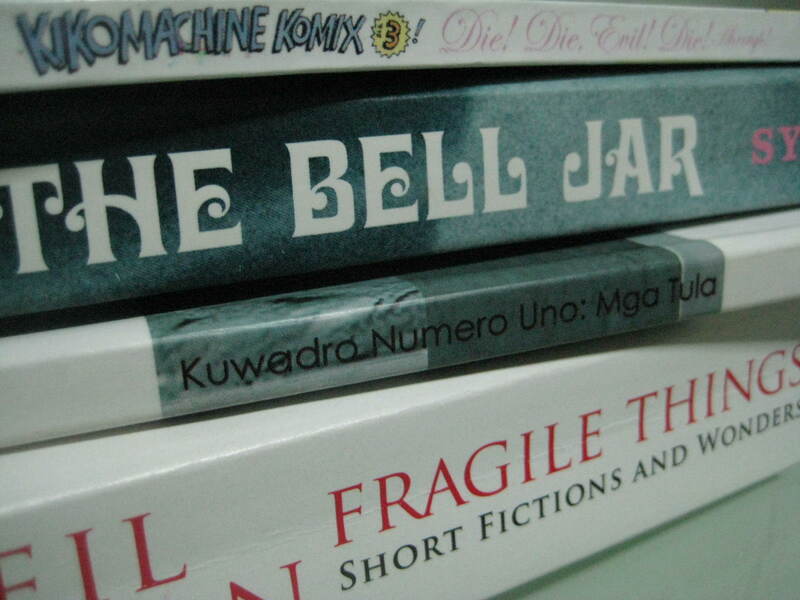 kikomachine, ma'am beni santos, plath... how varied can one get? i can go on for years just reading and reading books. and before I die, i know that one of the things that would comfort me is Jorge Luis Borges’s idea: “I have always imagined that Paradise will be a kind of library.” That plus an infinite well of songs that the dead can play day in and day out. heaven. i have a handout to read, some photos to go over for a magazine deadline, and that handout again that’s just an intro to cultural studies, but hell, every other sentence causes my nose to bleed. i know i have a short attention span, but what do you ought to feel when, after reading a long sentence, you punctuate it with this observation, “Nose bleed”? Heh. I try, as Macy Gray would sing, but I stumble! i have a new indie addiction, and i just downloaded her songs last night (yes, while clutching that handout). i’m excited to listen to her songs over and over again. and oh, i’ve started building my playlist out on youtube, and she&him is there along with asobi seksu and lenka. i discovered a new book sale near our place, but definitely, i won’t go there on my own. the place just bears the promise of countless sexual harassment moments. got myself a sylvia plath book. the bell jar. i know, i know, it’s a disgrace to own a copy this late. forgive me. the weather is just schizo. i like it. ambiguity. it rains, then the sun becomes relentless, and the day goes humid. ambiguity takes a walk on the rain, after alunsina. You have deactivated your Facebook account. You can reactivate your account at any time by logging into Facebook using your old login email and password. You will be able to use the site like you used to. Like I used to? What are you talking about? I never applied for a Facebook account. i tried to rise on my toes as if i were wearing pointe shoes. ouch, but a delicious ouch. try it to see how pain solidifies. can’t wait to share with you my quick photos of fire trees. now that summer’s starting to give us her farewell spiel, i have to immortalize these lovely creatures here. soon. i have to go back to the drawing boards. but i’m sure my little eva (she’s my alternate ego; like watterson’s calvin, only she has a wormy for hobbes) will find numerous ways to distract me. i am a golden god, what's up? The singer confirmed the couple said their vows just over a week before her 36th birthday on June 1. 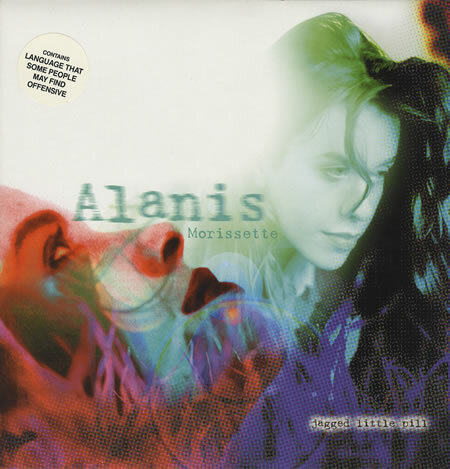 In the past, Alanis has made no secret of the fact she would like to have children by the time she is 40, but has claimed she doesn’t ‘believe’ in the notion of marriage. She said: ”I would definitely consider adoption, no question about it, at some point in the future. ‘Ideally, I’d like to be married and starting a family before I’m 40, even though I don’t believe in the concept of marriage in the conventional sense. the minute the student volunteer handed the receipt to me this morning did i realize I am again a student. i did feel like one when i did a walking tour of the university the other day, hopping from one building to the next to accomplish one step out of a dozen. it was unnerving. even my deodorant threatened to give up on me. i suddenly missed ADMU enrollment despite my consistent misfortune of always landing in the last batch of enrollees as commanded by enlistment lottery. that plus the fact that i didn’t know M.A. aspirants/students are given priority. i never clung to a piece of paper like i did when i was in line to book class slots. # 36, you are now one of the more memorable digits in my life. tomorrow is my first day, and i admit, i’m beginning to have first-day jitters. in contrast to that, i am prepared in terms of arsenal. i have notebooks, a new water bottle, a pen that assured me that a peso is to be donated to a tree planting drive, intermediate pad, correction strip, and a couple of lit books. this is it — a new role in a dream school in a challenging course. to conjure the world of metaphor and heightened sensibilities, I leave you with this poem. incidentally, this poem is also posted in evagubat.com as a way to kick start Lit Mondays over on that site. the well-swept ground has matched it. Friends know what my dream school is. At 28 years old, my only chance of getting in that school is by taking an M.A. course. And so armed with a bag weighed down by an umbrella, a book, mp3 player plus other knick-knacks, I trooped to that school to enlist and enroll today. I found myself surrounded by packs of undergrads toting plastic folders containing important looking sheets of paper. It reminded me of my long-lost habit of bringing folders and pieces of paper during college enrollment. I’ve familiarized myself with the process, but when I got to the department, my admission slip wasn’t ready yet. Step 1 is nada, and the other steps are still a day or two away. Was I bummed. I can’t wait to share with you upcoming misadventures. I usually have these during enrollment. Heh.